Autolog control systems are programmed and fully tested according to our customer’s preferences by our knowledgeable team of engineers and technicians. The Allen-Bradley® programmable controllers ControlLogix® and CompactLogix™ series are used in most of our systems, allowing us to meet the industry’s highest standards. Beckhoff® controllers are also used in very high speed applications. Autolog control solutions bring together optimized solutions for every piece. At each stage of the wood transformation process, our system takes charge of the actions needed to execute optimal cuts in order to maximize the value added to our partners’ primary materials. There is real-time monitoring for every piece in order to adjust the transformation process to the optimal solution as the piece moves along the production line. An intuitive human-machine interface (HMI) is provided with each of our control solutions to allow operators to quickly take charge of systems after they are installed. See the properties of this interface under the “About the human-machine interface (HMI)” tab below. Stacker with automatic positioning according to dimensions and grades recipes, package information tracking from bins up to the end of the package outfeed including strapping machine recipes, automatic paper wrapping, etc. Planer line: controls the entire line from the tilt hoist to the sorter. Many options can be added: automatic speed control for the entire mill, re optimization, real-time product cancellation, mixed product management, etc. Our most advanced product. The Autolog Setworks is a hydraulic multiple cylinder positioner. A touchscreen enables you to configure the position of different cylinders according to the output status coming from any equipment, logic controller, button, etc. It also contains a diagnostic page that enables you to see in real time the input status for positioning and the actual position of all the movements. Our systems use state-of-the-art control technologies. For example, Rockwell Automation products, which are widely used in North America specifically because they easily integrate with third party hardware components, are an integral part of our solutions. Moreover, our systems use Ethernet communication protocol which, in addition to being the dominant standard for North American equipment manufacturers, is perfectly adapted to the “Internet of things” concept inherent to the arrival of Industry 4.0. Specifically, choosing this technology enables the harmonious integration of our solutions into existing systems as well as remote diagnostics and adjustment. Further, our design and integration team has vast experience with the largest wood transformation equipment manufacturers, which facilitates the integration of our control systems for all types of projects. Our very high frequency applications are executed on Beckhoff Industrial PCs. This product uses a four-core processor and permits—for example—a clock speed of 10GHz and the processing of 4,000 inputs/outputs while executing 400 scans per second. The TwinCAT 3 software platform further permits the integration of applications developed in C++ in the Microsoft Visual Studio environment or developed in MathWorks’ Matlab/Simulink. This flexibility allows us to develop our own high-speed solutions without being restricted to the proprietary functions available in conventional automated control systems. Therefore, through this technology, Autolog makes its mark by developing applications that are not available to our competitors. Spare part availability and cost are an additional advantage of using industrial PCs because they utilise the same components (produced on a very large scale) as those contained in personal computers. The "Fence Checker " is a monitoring system whose primary function is to validate the accuracy of the moving fences and ultimately the position of the boards at the sawmill or planer mill trimmer line. The fence checker is located at the wood line and is linked to the board line controller. The system consists of a high precision scanner located just passed the moving fences. The final position of each piece is then measured by the system and compared to the trimmer optimizer’s final solution. The accuracy of the board’s position maximizes the estimated grade and its optimum value. The fence checker can reach a resolution of 0.040". If one or more fences could not make it to the position as determined by the optimizer, the line’s PLC will generate one or more alarms and store the data to provide a detailed production report at the end of the shift. At the primary breakdown, it is a well-known fact that proper gap management has a direct impact on production and bottom-line profits. In essence, when the gap between logs is too small, the line must stop to position the cutting tools. When the gap is too long, throughput is reduced. Therefore, it is important to maintain a constant gap between the logs, which is easier said than done. This is where Autolog's solution comes in. 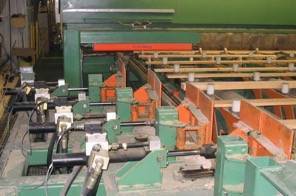 The camera for gap management is located at the log infeed of a sawing line. By adding the camera, it will detect with precision both the beginning of the log in the feeder, or the absence of the log, as well as the end of the log on the conveyor, maximizing the use of the sawing line while maintaining a constant gap between each log. The system also eliminates virtually all log crossings. 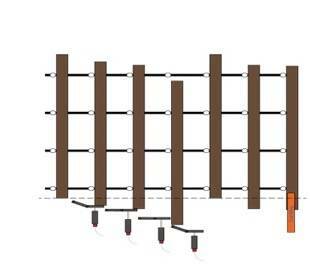 For example, a log that is too small to be detected by the other type of sensors may result in two logs crossing over one another in the chain, triggering a production stoppage in order to separate these two logs. Without this solution, customers must use several types of sensors to detect these two logs, for example photocells such as analog or single point, only to achieve average results. Thanks to Autolog and the early adopters, customers achieve excellent results while reducing downtime and production costs. This may be the quick fix you are looking for and we are ready to help.